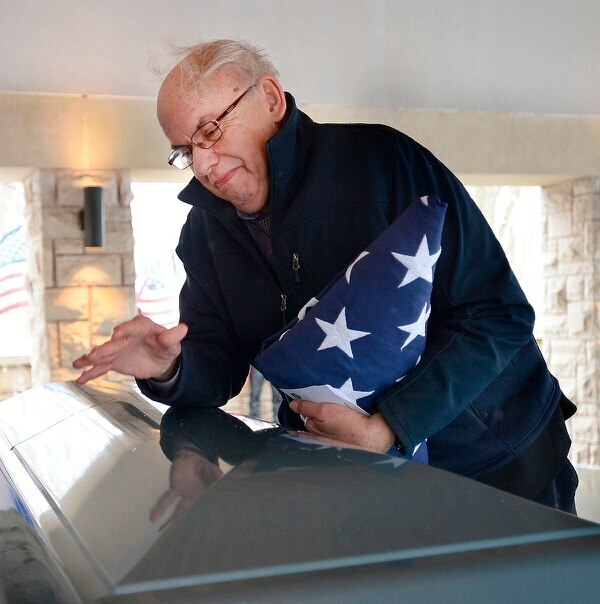 RITTMAN, Ohio — Having waited 64 years for the reunion, Rex Beach struggled to leave his father’s casket when the time came. "It's hard to let go once you've found what you've been searching for all your life," Beach said following a ceremony at Ohio Western Reserve National Cemetery. Thursday was the culmination of Rex Beach's nearly decade-long quest to find his father, William A. Beach, and return his remains to Ohio for burial. Rex Beach, 66, of Canton, never knew his father. William Beach left Rex and his mother when Rex was 2 years old. The son has just one snapshot together with his father. Rex Beach started searching for his father in 2010 with the hope they might reunite. Using Ancestry.com, Rex Beach gathered information from distant relatives. He learned his father was from Lima, that he served in the Army Air Forces in England during World War II, and that he died at age 80 from cancer in a Dallas, Texas, hospital in 1999. Because no one claimed William Beach's body, Dallas County officials buried him in a pauper's grave. Knowing his father was a veteran, Rex Beach wanted to bury him with military honors in Ohio. While he spent a year locating his father, it took much longer for Rex to recover his remains. Last year, the office of Sen. Sherrod Brown, D-Cleveland, helped Rex confirm that his father could have a military burial and Texas officials approved the transfer of William's remains. Rex also got a $10,000 loan to pay the cost of exhuming his father's remains and flying them to Ohio. The last chapter of Rex Beach's quest fell into place this week. Guerrero-Dean Funeral Home in Grand Prairie, Texas, exhumed William Beach's body from Southland Memorial Park on Tuesday and placed the remains in a light blue casket. The North Texas Patriot Guard Riders escorted the hearse with their motorcycles to Dallas-Fort Worth International Airport, where the casket was loaded on an airplane and flown to Cleveland. Rex Beach, Rossi Funeral Home and the Ohio Patriot Guard Riders met the casket at Hopkins International Airport later that day and brought it to Canton. "This is a first," said funeral director Robert Forchione. "I don't ever remember having someone pass away and the family's looking for them and they find them and do all this 20 years later." Thursday was the final step. Rex Beach welcomed a handful of friends to Canton Nazarene, where Pastor Dan Hanson held a brief service, the first anyone had held to remember William Beach. Hanson said Rex Beach's perseverance to give his father a proper burial showed honor and forgiveness, ideas that society seems to have given up. "Thank you, Rex, for not joining with the crowd," Hanson said. "Thank you, Rex, for swimming against the current of this culture. Thank you, Rex, for never giving up. Today is happening because you did not give up." Pallbearers then loaded the casket into a hearse and the Ohio Patriot Guard Riders escorted William Beach through Canton — down Market Avenue N to Tuscarawas Street E and onto Interstate 77 — and to the national cemetery in Medina County. "Showing respect to the family and the veteran is what we're here for," said Dennis Hillberry, captain of the Patriot Guard Riders group that escorted William Beach. "It gives you a sense of pride to make sure the vet was honored." Light snow dusted Ohio Western Reserve National Cemetery when the procession arrived. Cold weather had forced the Patriot Guard Riders to trade their motorcycles for trucks. At an open-air pavilion, an honor guard saluted William Beach with three rifle volleys and a bugler played taps. 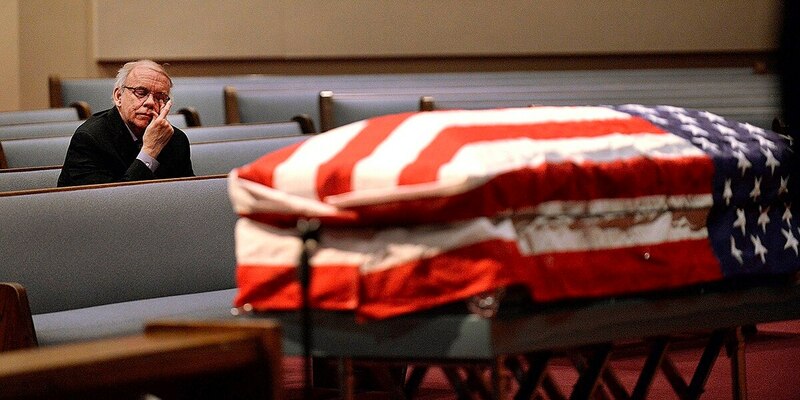 Two soldiers folded the American flag draped over the casket and gave it to Rex. He clutched it to his chest as Pastor Hanson led mourners in the Lord's Prayer. After the ceremony, Rex Beach said he felt grief mixed with relief. He was parting with his father but on his own terms. "This is the beginning of a new part of my life," Rex Beach said. "I feel more whole. Something I've searched for all my life has actually come true."